A couple of months ago I wrote about the first Cat Cafe that opened at Setapak, Well I found out recently that there's another Cat Cafe that just opened up at SS15 so naturally I had to go check it out because it's so much closer than Setapak for me. Coffee Cottage is located at SS15 at the Asia Cafe row just below Blitz Gym (The pay-per-visit one) at the corner of the shoplots row facing Asia Cafe. Compared to the first cat cafe I've been at, this was definitely leagues ahead. When I first stepped foot into the place, it looked and felt like a real cafe. There wasn't any overbearing smell as well. Another good thing about this place is that there isn't a 'cover charge' to the place, the only obligation is to get a cup of coffee each. They are currently having a promotion for their cakes* & drinks* at RM5 per piece/cup for a limited time! 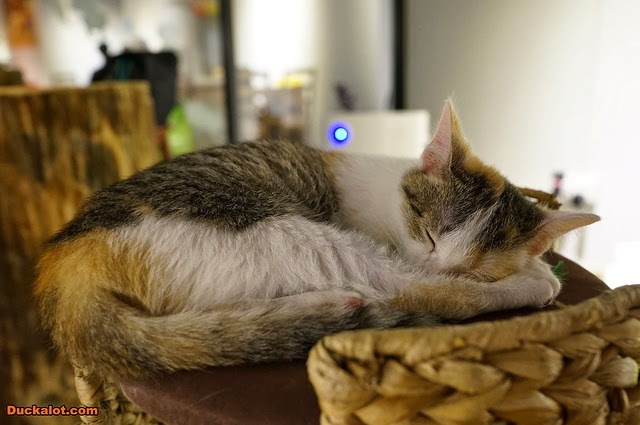 Well what's a Cat Cafe without any cats? When you first step into the cafe, you'll notice that there isn't a single cat in sight. That's because there's a different section walled off by glass doors and walls where the cats are, so you can choose to enjoy your coffee either without cats or with cats accompanying you. But why wouldn't you want to play with cats? Of course you'll be able to bring your coffee and cakes in, just make sure the cats doesn't get their hands on it. There's even a comfy bean bag for you to sit on, the whole atmosphere of the place is very inviting and cozy, there's even a dedicated air purifier for the place to remove any odors. Though I didn't notice any foul odors but that's not applicable seeing how insensitive my nose is. This cat was anticipating the teaser. Do be careful of your belongings while at the cafe because these culprits will try to get in and make it into it's home. There's even a Roomba roaming the place, expect the ocassional hop-on hop-off cats. I would definitely be back for another visit soon seeing as how we were rushing off to a friends birthday that day. So if you're a cat lover who doesn't have a cat, do check this place out! these little guys found a comfortable job and a comfortable living! haha..